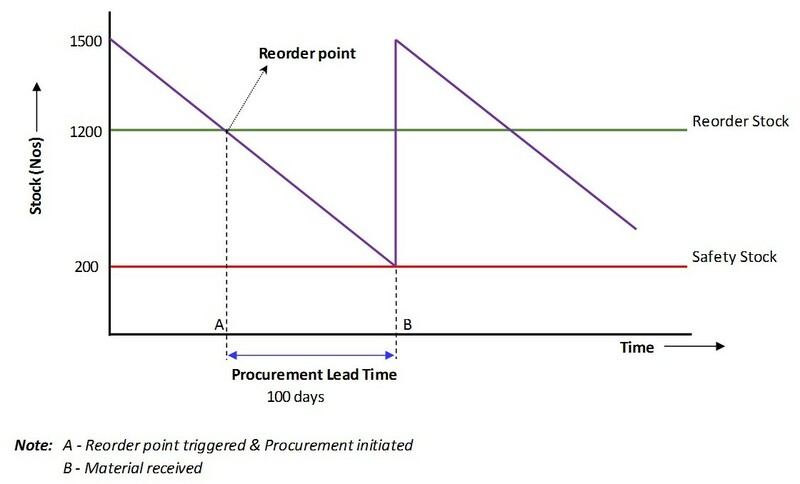 Of all the above, most widely accepted method in consumption based procurement planning is the reorder point formula. What is reorder point? Does it vary from material to material? Reorder point is the stock level of a material below which procurement process for that material needs to be initiated in order to ensure availability of stock in future. Reorder point of any material is a function of its consumption and time taken for its procurement (as can be observed from the below formula). Different materials have different consumption rates and requires different amounts of time for their procurement, hence reorder point is different for different materials. How is reorder point calculated? Number of units (of material) consumed per day. Time required for procurement of a material. It is the time gap between point of initiation of procurement process to receipt of ordered materials at stores. Buffer stock to be maintained at stores in order to handle excess consumption during procurement lead time and or delivery delays. Hence, in order to calculate reorder point of a material the above three (A, B & C) essential parameters are to known. Let’s calculate the reorder point of “3-Phase 25KVA DTR” whose essential parameters are as follows…..
. is required to procure it.
. a safety stock equal to 20 days consumption is required. Hence, a reorder point of 1200 Nos is to be maintained for “3-Phase 25KVA DTR” and it can be graphically depicted as….. If the stock of “3-Phase 25KVA DTR” at stores falls below 1200 Nos, then procurement process is to be initiated in order to ensure availability of “3-Phase 25KVA DTR” in future. Why Safety stock is to be maintained? Safety stock for a material is maintained to handle the following…. 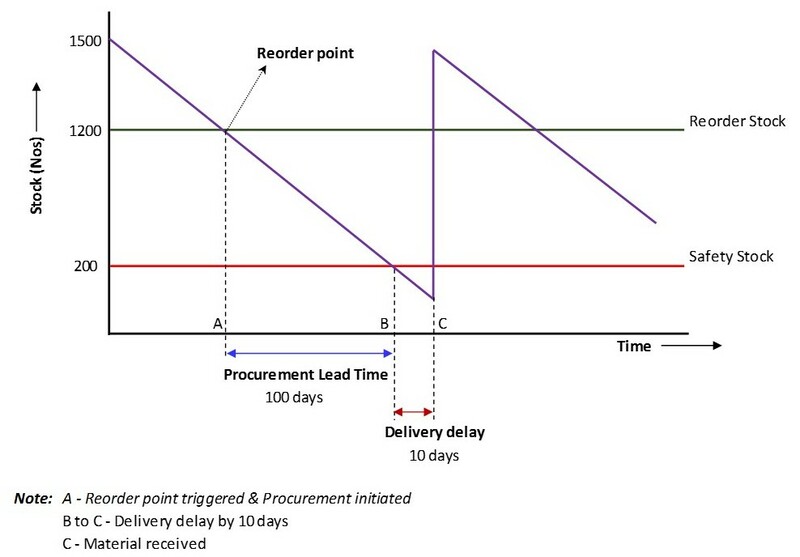 .♦ Excess consumption during procurement lead time.
. ♦ Delivery delays by vendors. In previous example a safety stock of 200 Nos is maintained for “3-Phase 25KVA DTR”. 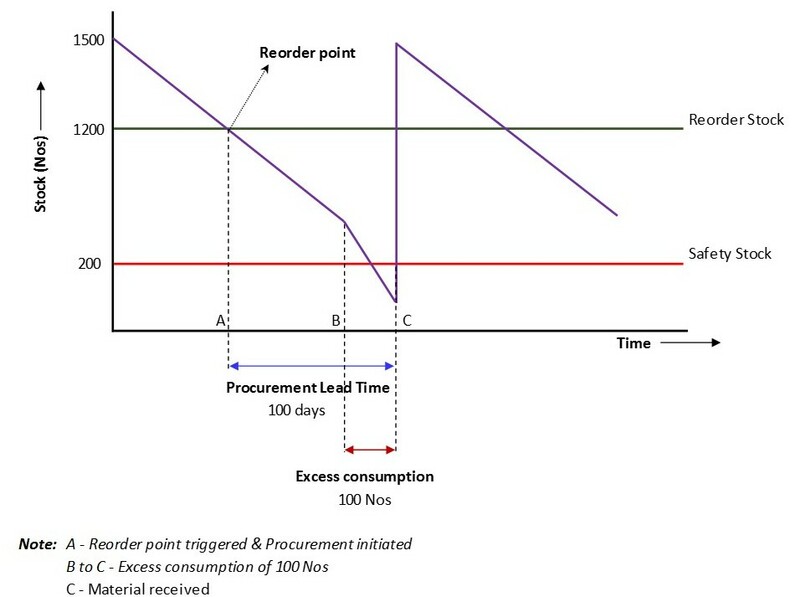 Hence, any excess consumption upto 200 Nos during the procurement lead time can be accommodated without running out of stock at stores and is as shown in the following figure…. Sufficient care to be taken in arriving at reorder point of a material such that at any point of time optimal stock is available at stores without excess or less. Please note that, reorder point only indicates when to initiate procurement but it does not tell the amount of material that is to be procured. Advantages of reorder point based procurement…..
♦ Encourages discipline in procurement planning. ♦ Promotes market research before procurement. ♦ Allows early identification and resolution of procurement problems. ♦ Allows sufficient time to obtain mandatory approvals. ♦ Ensures availability of stock at all times. ♦ Storage and holding costs of inventory are minimized. ♦ Improves Company’s cash flow. What our Company has done? As our Company runs on SAP-ERP, reorder point of all the materials (procured by P&MM wing) were calculated taking last 365 days consumption and time required for procurement into consideration. Calculated reorder point of all the materials were maintained in SAP. A reorder point report (TCode: Zmstore23) was developed. On every Monday, SAP system automatically sends reorder point report (for reorder triggered materials) via SAP express mail to all the concerned P&MM staff of Corporate Office indicating the need for initiation of procurement process. Further, tracking of procurement process from the point of placing of tenders on e-procurement platform to receipt of materials at stores is also designed (Tcodes: Zmtender1, Zmtender2 & Zmtender3). ♦ Discipline in material procurement. ♦ Avoiding procurement of non-moving materials. ♦ Tracking procurement process for taking effective and appropriate decisions. ♦ Ensuring availability of materials at stores at all times.
. a 10% savings rate). From 27th January, 2014 – reorder point based procurement and tracking of procurement process is being taken up by our Company. Hi JP this is helping a lot to plan for procurement.Generally field engineers not sending indents in time and all of a sudden they request for material,to avoid delay we are planning in advance.But still field engineers furnishes ir indents month wise we can even fix the delivery schedules and can ask to supply as required. It is a ruest to all field engineers to communicate and share any difficulty faces at the time of delivery at stores.Instructions were issued to all ADEs/stores to issue material as and when operation engineers are approached.pl share with P&MM wing when ever faces any difficulty at the time of issue in stores, we will be happy to serve you . Yeah sir… Now I am trying to explore how best we can build indent process in SAP replacing the present manual process, which helps in tracking the drawls as per indents. it is very essential to procure material based on consumption based procurement planning with automatic reordering as anantapur circle store is facing shortage of 25 kva DTRs since two months, and much pressures are coming from normal plane consumer who have invested lots money to estimates, causing much delay to work due to lack matching material and major materials and in case of non major materials the situation is more worse materials like tapping cross arms, spacers, Ci earth pipe ,3c ab cable and purchase wing people of our circle not procure material when the stocks are threshold point .Hence it is requested to please strengthen purchase wing people to act immediately when stocks are low level based on past consumption history to limit non movable material. From 27th January, 2014 reorder point based procurement was initiated in our Company. Takes sometime to get streamlined……. Very good analytical presentation of material management functions, taking full advantage of SAP MM features. As stated it is very good tool in the hands of management for initiating procurement process, for all such material falling short of reorder level. However Caution shall be taken to ensure procurement lead time as determined, by which time material shall reach stores, other wise inventory plan will go for task. Guidance shall be taken from P&MM wing while determining lead time judiciously duly keeping in view procedures involved in file movement in procurement process. work execution as well and the contractor looses man hours incurring additional labour &transport cost for moving non available material at a later date. Thank u sir. Yeah sufficient research was done by P&MM wing in fixing the material wise procurement lead time and got it approved by management before implementing…. care taken in all aspects still if any suggestions pl share .How ever the coordination will be the major issue in resolving the problems which field engineers are encountering.On behalf of P&MM wing we assure you quick disposal at any time they need our intervention.